What is unemployment insurance? As Congress currently debates whether to extend unemployment benefits to the 2 million or so people who still depend on them, it's a good idea to reflect on what these benefits really are, and who really gains from them. Firstly, I am all for unemployment insurance. I think it's a necessary function of a large economy like that of the United States to install mechanisms meant to stabilize society in the event of a downturn. There's no doubt that some people abuse the system and disregard work even when it is available, but most use unemployment properly until they find gainful employment somewhere else. However, while an individual benefits from unemployment for the 26 weeks or longer he is is on the program, I submit that the real beneficiary in this circumstance is his mortgage holder or landlord. For most people, their first expense every month is either the rent or the mortgage payment. Next comes food, utilities, car and health insurance, debt repayment, and entertainment. For someone who's unemployed, the situation obviously doesn't change. One of life's cruel little truths is you still must pay your bills whether you have the money to do so or not. So the person cuts back on spending as much as possible, maybe eliminates things like health insurance, certain services, and becomes a miser with the food budget. You'd be surprised at the control you can leverage over many things, but one thing that's hard, if not impossible to change, is the rent or mortgage. Sometimes you can remortgage a home or reorganize a loan of some kind, and even work with your landlord on rent. But usually, employed or not, your rent and mortgage remain constant. This is where unemployment offers its greatest benefit. By allowing you to continue paying your mortgage, your bank's ledger book remains balanced. Stop paying your mortgage and eventually you go into foreclosure. Well, this affects more than you, the homeowner. It affects the bank's balance sheet, and possibly drives down the value of surrounding homes. No one wants to purchase a home in an area littered with foreclosure signs. Therefore, unemployment insurance is basically a stabilization mechanism created to assist the national banking system through economic turbulence. Basically, social welfare is bank welfare. Banks are the ones who stand to gain the most from unemployment, because they are usually the ones to get paid first by someone who receives UI benefits. I don't say all this to be cynical. I just want to point out the big picture. 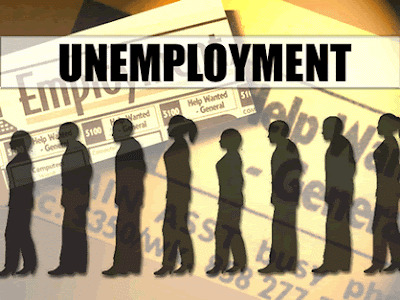 If there were no unemployment insurance, then when people lost their jobs they'd risk losing their homes, also. Even if you saved six months worth of expenses, there's no guarantee you'll find a job at the end of that time or that you won't be able to counter some other sudden expense from popping up. The fact is, UI helps soften the blow, but it's meant to keep the mortgage industry stable. Imagine if we had no unemployment benefits. Every time this country saw an economic downturn, you'd also see a wave of people lose their homes. That would upturn the banking system. Mortgage defaults, foreclosures, property seizures, you name it. It would be utter catastrophe every 5 to 7 years, which is the average time between recessions. For better or worse, the banks are the heart of the economy. When enough people default on their loan obligations, this heart undergoes a cardiac arrest. Then we see what happened in the 1980s and 90s with the Savings and Loan crises, and the September 2008 meltdown. I don't even need to point out that those crises brought about real hardship and undermined the whole economic system. So, as Congress dithers with whether to extend these benefits, it's important to understand the role UI plays in society. In many ways, it's a small cog that helps keep the big cogs from crashing onto our heads.